This building was a temperance coffee house and public library, given to the town by the Davies family of Porthmawr. The shop tenant, currently the British Red Cross, is still required to provide a hot drink to any “weary traveller” who requests one. This is why you can find a coffee vending machine at the back of the shop! 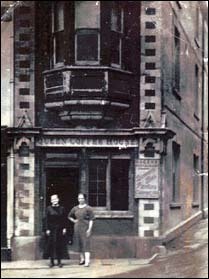 The Queen Coffee Tavern was built in 1884 by Percy and Caroline Wilhelmina Davies, who had moved to Crickhowell in 1877. They lived at Porthmawr, the Regency mansion beside the 15th-century gate house on Brecon Road. Percy was a merchant who specialized in South American trading. He and his wife funded various good causes. They built the coffee house as a place where local people could socialise without consuming alcohol. There was a library and reading room on the first floor, a residential flat on the top floor and a stable block behind. Percy died in 1894. Caroline died in 1903, aged 83, and left the coffee house and library to the town in her will. In 1904 Lady Glanusk unveiled a commemorative tablet on the building, which had been renamed the Percy Davies Institution. The coffee house was then run by the Moulder sisters. They are probably the figures in the photo of the building on the right (courtesy of Crickhowell Archive Centre). Anyone could subscribe to the library for 21 shillings a year. They could borrow up to three books at a time. In 1948 the Brecknock County Council took over the library, making it free to join. When a new public library opened in Church Lane in 1972, visits to the one in the coffee house dwindled until closure in 1980. The Percy Davies Trust sold the stable yard to provide funding for the building’s long-term maintenance and to generate annual income for distribution to local groups. Beneficiaries in recent years include sports clubs, arts groups, the credit union, dial-a-ride, Scouts and Guides.